In Barbados, Brush Your Teeth — Quick!! I awake this morning a couple hours after my early-bird husband Greg. I check the sea as I always do. The sea is full and it is raining. The usual serenity of the water has devolved to major upset with waves crashing. I stumble into the kitchen, put two Weatabix in a bowl, pour milk on top, and sit down to breakfast. I try to recall other recent behaviors indicating my husband had gone bonkers. Can’t think of any. Again he shouts, “Go! Go now!” This time he pokes his head around the corner as he says it. He waves his arms to demonstrate urgency. I take another bite. He reads my face: it says my husband had gone nuts. Ah, now I get it. I bolt to my bathroom. I brush. (“I’m Jane and I’m addicted to freshly brushed teeth.” Don’t judge; what’s the one thing you’d do if you knew the water would be off in five minutes or less?) I am just in time. I watch the water from the tap slow during the very long two minutes of my electric toothbrush. For my final rinse, the tap barely trickles. Then, nothing. The taps have been dry ever since. 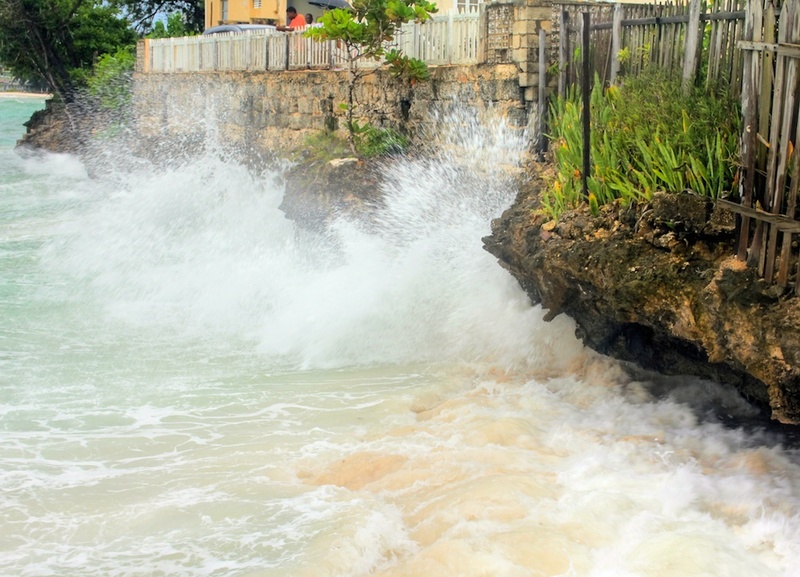 Water going off is a very rare occurrence in Barbados. We (the whole island) is not prepared in any way for this. The water has gone off exactly twice since I moved to Barbados nearly 3 years ago; each time it was off less than an hour. The Caribbean Sea behind the St Lawrence Church next door to where I live, on a usual day. Calm. Peaceful. Same area during today's small storm (I took this at 4:30pm). Safely on my patio, I love witnessing the Caribbean throw a hissy fit. It’s now 5:00 in the afternoon and still no water. The Barbados Water Authority offers no explanation, gives no estimated time of repair. The radio says two-thirds of the island is without water. Greg arrives home from work and hauls buckets of sea water into the apartment to flush our toilets. A few guests in the building are angry. “What,” I think to myself, “they’ve never had an upset they can turn into a little adventure?” I mean, hunkering down for the duration – banding together to get through and all that – it’s kinda fun. It’s not like we’re in any danger or anything. Hunkering down while watching the roiling sea from the comfort of our patio is a blast, and even more fun with a rum punch and pizza ordered in. Terri’s plane lands. She reads the text and calls me; she wants to stay here, water or no, she says. We welcome her with open arms. And a rum punch. Beautifully written! At least the water’s now back… after 48 smelly hours. If this happens again and your guests would like to have a shower, they are welcome to come to our home at Batts Rock with their soap and towel. I agree, turn a little problem into an adventure. We had to do the same thing on St. John when the cistern ran dry. We used buckets of pool water to flush the toilets. It was sort of fun. Did you go to the store to get bottled water? Hurricane supplies in storage? Hi Jane…I would beg to differ with you on this point: Water going off is a very rare occurrence in Barbados. 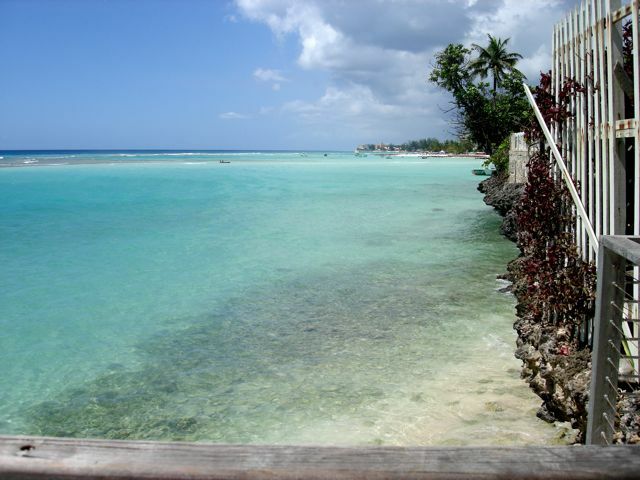 There are areas of Barbados that are constantly plagued by little or no pressure, and often without water altogether. Unfortunately the BWA has some serious issues including manpower, tools and equipment etc. How insensitive (even arrogant) of me to assume that the entire island functions exactly as it functions where I live! I didn’t realize that there was a chronic water problem in some areas of the island. I’m sorry … when it’s an ongoing, everyday challenge to get water into one’s home it’s not fun-and-games-let’s-pretend-we’re-camping. You are right about the Barbados Water Authority’s issues around manpower, tools, equipment … I will add that their customer service and public relations could use a makeover as well. Thank you for writing, HomeGrown. I appreciate your input. I have no hurricane supplies in storage, RumShopRyan. None. Zip. I really need to get with it. A hurricane hasn’t happened in Barbados since the 1950s but that doesn’t mean it won’t ….. cuz it will. Corrie, you not only make beautiful art, you are a kind and generous soul. Thank you for your kind offer. Let’s hope it won’t be necessary, but time will tell … ! You may have a line of grateful folks with soap and towel in hand outside your door one day. Not being able to, it struck me how many times a day we actually do shower. I’m in the sea or pool at least twice a day … both requiring a shower after. Then before bed to help me sleep and again in the morning to help me wake up. It’s a bit much and I’m trying to cut back a bit and make the showers I do take quicker. Y’all does crack me up (hehehe) especially Jane. The next time Greg tell you to brush your teeth quick … go do it. Yes, I’ve learned my lesson … the guy’s not a crackpot! .. he just gets to the point!